Yesterday's truth becomes today's falsehood. In the third part of his 'Creating the Future' series, Paul Schloss looks at how past political victories come to lose their meaning. He suggests a radical solution. 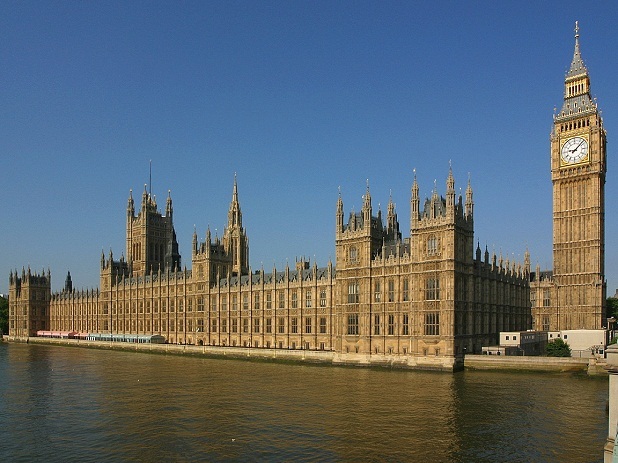 House of Parliament, seat of (non) power? Communism, that great cul-de-sac of left wing thought and practice, is a decaying corpse. It had its uses, scaring Western liberals and conservatives into détente back home; it made them more responsive to the concerns of its industrial working class particularly after the two great wars. In the United States the reaction was usually more intolerant and extreme, although it couldn’t eradicate its own Communist Party; important to both in the political campaigns of the 1930s and the later civil rights movement. The party was never as important in the quieter political culture of Britain, though it is harder to gauge its influence on our intellectuals, many formed within Communism’s ambit, and thus the wider society. Michael Albert, thinking of this influence but not the content, which he no doubt repudiates, wants to create a New International, that will provide the infrastructure to both embody and organise a mass progressive movement. He has outlined some general principles, asked for consultation, and began the hard work of creating it. I hope it will have success. However, I have my doubts. Its objectives are similar to those of Anthony Barnett’s and like them I wonder whether they will get popular support. They are too much of the progressive middle class, a segment of the society that many, possibly the majority, are sceptical about – “the chattering classes”, “do-gooders”, “dreamers”, “the heads in the cloud mob”… This is not to say that such an organisation shouldn’t exist, and that it will not do good work. Undoubtedly it will, in part by helping shape those cultural changes on which any progressive movement depends. However, its impact is likely to be limited: yet one more radical pressure group working on society’s margins. We shouldn’t criticise such activity; but we should recognise that such an outcome is not commensurate with Albert’s vision. To achieve this something more practical is needed. A movement, rather than a party, that is more attuned to the needs and ideas of those outside the political menagerie; and that appeals to the majority whose politics is simply that of the television screen and the pages of the mainstream press. It must repeat the success of the Chartists and the later fin-de-siècle progressives, expanding the political class to create an atmosphere of popular rebellion; the sense that something is fundamentally wrong with the society, and a belief that it can be changed; for the better. The first requirement of such a movement is convince the country that the opening paragraph of my ‘Victory Begins with Defeat’ is wrong: that we do not have full political rights any longer. Too many such an assertion will appear counter-intuitive. Walter Bagehot gave the explanation long ago in his seminal The English Constitution: the conventional understanding of political institutions lags behind the reality. Before he wrote this work it was believed parliament ran the country; and it was debates inside the House of Commons that decided its fate. He argued that all the key decisions were made beforehand, in the cabinet; the real source of political power. The commentators hadn’t noticed these subtle changes, for they mistook the past for the present; failing to see how the content of yesterday becomes the mere forms of today. R.H.S. Crossman, in his introduction to the book, showed how the same process had continued a century later. 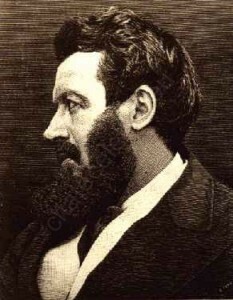 Bagehot created a new understanding of British government, which became the new conventional opinion. However, by the 1960s these views were out of date; and the commentators were not aware of how power had shifted to the office of the Prime Minister. They still talked as if cabinet made all the decisions. This is a common failing of conventional thought; unable to go below the surface of things, it takes the fresh ideas of the previous generation as the accepted wisdom of its own. Intellectuals are particularly prone to this tendency; placing far too much importance on ideas, to the detriment of the reality that underpins them. They are at the mercy of habitual thinking; an occupational hazard. The consequences for the general public, who rely on these professionals for their analysis, is severe: a poor conception of current realities, framed through a collection of ideas that are highly conservative and badly informed. One result is that progressive politics is that much harder to achieve. We have the forms of popular democracy, and we live within the rhetoric of political egalitarianism, but its content has been emasculated. The important, albeit limited, achievements of universal suffrage were from the start resisted and diluted to ensure that the reigning establishment would remain in charge. These attempts weren’t entirely successful, thus the creation of a welfare state and post-war social democracy; and some control of the corporate sector, which was to its long term benefit; though the owners did not reap its full rewards: unprecedented growth was accompanied by a relative levelling of salaries and benefits; while the shareholder became subservient to the director, and the chief executive to the workings of his bureaucracy. Here was the resentment of the rich and powerful; which has played out so spectacularly over the last 40 years, and which has seen a movement to remove all content from British democracy, to leave us with the empty forms. It is a campaign that has had much success, although its failures have been noticeable; devolution being one of them. Generations have built on the work of the Chartists, but we have returned to a place they would have recognised: a majority excluded from real political influence. Chartism has to be reborn, with a new strategy to secure new political rights; based on the recognition that power has shifted away from that house in Downing Street: to the headquarters of BP, the offices of the IMF, and the new city slowly colonising Brussels – the European Union, itself dominated by the corporate realm. Political rights are once again determined by wealth; with parliament its too obedient servant. This transformation of our politics is not reflected in our national press; although the EU is rolled on like some Gothic monster, as if this was the cause of all our ills. Its actual role is hardly understood – it is a functionary of European business, imposing a multi-national infrastructure to make it run more efficiently. To absorb the messages of national press is to live inside an illusion; it is still to believe that ministers are in charge, when they are little more than county councillors, albeit on a larger scale. This is reflected in all sorts of ways, not least in a culture that worships the forms, but avoids the real content, of corporate control: the marvellous image of Apple but not the exploitation at its root – most of the hardware is manufactured in low cost factories in China. This is not surprising since the corporations provide the means to maintain the illusion: massive corporate spending, extensive ideological support, continuous lobbying, and the embedding of the political class deep inside its own structures and culture: thinks tanks, funded institutes, directorships and consultancy posts. The ideology of the state has been hollowed out; its core filled up by the market authoritarianism of the multi-national corporation. The task of the left is to reverse this process; to give back to the state some substance, so that it can manage and regulate these new lords and masters of our universe. Part of that strategy is to create a new public discourse; a new sense of the public interest. That there is a popular demand for such a strategy is evidenced by the PR campaigns of our recent governments: Thatcher’s attack on the perceived cultural elitism of the 1960s, John Major’s ‘Back to Basics’; the communitarianism of the early Clinton years that slid so easily into in the Third Way of Blair. Today it wears a different dress, that charity shop favourite: the Big Society. We cannot return to the high-minded, and often autocratic and unsympathetic, bureaucrats of the 1950s and 60s. Although it was economically successful and relatively equalitarian, in both the voting booth and on the production line, we cannot go back to the social democracy of that time. Part of the Radical Right’s success has been to concentrate on its very real weaknesses, particularly the intrusiveness of the state bureaucracies, whose officials were often disliked and begrudged, and occasionally hated. That said, it is only the state that has the means to subdue the monster corporations – it is the only institution that is both part of the new institutional world of global capitalism and is open to the concentrated pressure of public action. We have to strengthen the state, but also make it more responsive to the needs of its citizens; one of the reasons the 1960s era is so hated by reactionary liberals who began to take over in the later 1970s. They believed the state had become too large, and thus too weak; it was responsive to far too many people. The state, they thought, was a building that was too big and had too many doors to the outside world. They moved it to a smaller site and bricked up most of the entrances. The propaganda has been very different: today our public organisations are supposed to be sensitive to the needs of their “customers”, encouraging greater involvement in their operation. There is some truth to this, but too often it has been the forms of control that have been devolved, not the real substance. It has also been a period of highly lucrative employment for consultants and PR executives, who have lived well off the government and our other public bodies – think of how much is spent by councils, charities and housing associations in creating illusions about their services in all those glossy newsletters and advertising campaigns. This is closely linked to the increased remuneration of the senior officers, which in turn is connected with the introduction of “market” techniques, such service auditing and performance management. There is a class struggle going inside our public services, although few have noticed. In the 1930s it was obvious that free market capitalism was inefficient, irrational, and counter productive; even to some of the capitalists themselves. This led to many state initiatives, both direct and indirect, that encouraged rationalization, through trade associations, cartels and the creation of a few large firms in each industry. Born, raised and educated by the state, these corporations, once they reached maturity, wanted freedom from it; and to a large measure they have achieved this; thus the deregulation craze that took off in the 1980s. They have since gone much further. In large degree they now control the state; after a period of class war they have enfeebled the trade unions and reconfigured the ruling elite; weakening both the professional classes and the aristocracy; leaving the society with a narrower range of values, and political options. Market liberalism is the only game to play, if we are to believe the mainstream culture, itself dependent on corporate money. In many respects such a society is highly repressive, a business culture insists we submit to the rules of the institution, but it does give freedom to the corporation and the consumer; while it appears not to tell us what to do – a conspicuous failing of the cruder authoritarianism; its theology much more onerous. Democracy is equated with capitalism; freedom with the money in one’s pocket. The market libertarianism that fills the commentary pages glosses these unpleasant facts; equating freedom from the state as the only freedom; and giving license to the barons of the marketplace; the patrons of a new priestly caste, who reward them well. It has taken over 50 years of massive funding and dedicated organisation to achieve this illusion; well documented by Susan George and Thomas Frank, the latter in a number of books. One task of the left is to help the culture return to the consensus understanding of the 1930s, to an acknowledgement of the bankruptcy of laissez economics (still the case but camouflaged by the new theology) but with a different diagnosis: it is the multi-national corporation that is the problem today. Its highly rational methods undermining the needs of the individual and their community, by redeployment of resources offshore, and the creation of a highly irrational culture, which values market obedience and the inflation of our desires: everything is targeted at that next shopping hit. This culture has been assiduously manufactured for at least a hundred years; but has escalated sharply since the 1960s, since when it has taken over government, and much of our intellectual class. One of its chief sources are the right wing institutes and think thanks that so litter the mainstream commentary, with their press releases and carefully targeted reports, and which are often copied verbatim in our newspapers and magazines of opinion. These have to be confronted directly. They have to be delegitimised if the public discourse is to be reclaimed for the public interest. Another task is to educate people about the limits of parliamentary politics; encouraging action that takes place outside Westminster and County Hall. This is highly radical, but also reasonable and achievable – people instinctively know there is something wrong with the political class, and that it does not represent their concerns. It is an anger that can easily be tapped and mobilized, but it needs a proper platform, and some idea of what is to be achieved. There are many interesting aspects to the Arab Spring. One of them is how many comparisons there are to the revolutions in Eastern Europe, but how few, if any, are made to the fall of the Second Republic in Italy; when the corruption of the political class became so repellent that the nation threw them out. What followed was in many ways worse, but it does suggest that a radical attack on the political institutions, which is in tune with people’s sentiments, may be more successful than small-scale reform; at least in the short run. What is important is to build on that destruction, something the Italian left had failed to do. Though it seems preposterous to call for the overthrow of Westminster, such a goal may have more chances of success than calls for proportional representation, too technical and too closely allied to the existing political parties, if one wants to fundamentally change the voting system. It is the pressure of public action that counts in the long run, for it feeds a natural insecurity of our ruling elites, and makes them susceptible to accommodation. It is our weakness that makes them arrogant. 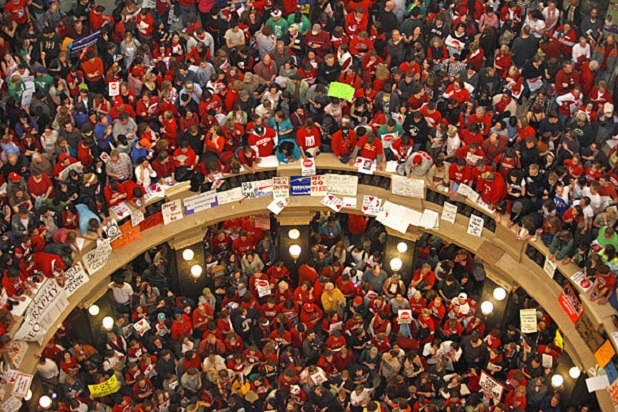 What Italy showed in the early 1990s, and what Madison Wisconsin shows us today, is that people will respond to direct attacks on their well-being and to focussed campaigns against injustice. The task for the left is to somehow create a culture, a populist zeitgeist, that can galvanise people to act aggressively towards the existing institutions and their corporate backers. This will not create a revolution; we should hope, perhaps, that it will not. But it may provide the beginnings of a future transformation, a shift in the culture that can bring about progressive change; like the fear of the Chartists in 1848; of the workers in Hyde Park in 1867, and of the syndicalists and shop stewards from the early 1900s to 1919. Power is frightened of power, and respects it. This is something the left has once again to learn. Much progressive thought is in the middle classes; often quite isolated they may have forgotten this lesson, if they ever learned it. The intense, but diffuse, dislike of the profiteer was always secondary to an even more intense, but better directed, dislike of the ‘working man’…. [they] thought they had cause to fear the trade unions… [who] were endowed with an almost supernatural power: Masterman thought that the ‘salariat’ contemplated the programme of the miners ‘with something of the emotions’ felt by primitive people’s when they gazed at an eclipse of the sun.“ (Ross McKibben, Classes and Cultures, England 1918-1951). These were the middle classes fearful of what they might lose. Today the middle class has widened to include a majority of the population; and it is they who need to be organised to frighten that relatively tiny elite who run our most powerful institutions. The culture has to be made amenable to a political programme that will once again secure a new dispensation. This can take a long time, often generations (the fear of the salariat in the early twenties was replaced by a wary acceptance in 1945; its younger public professionals and technicians voting for Labour). To facilitate this an infrastructure must be created that allows for the long game, the inevitable burn out of people who cannot achieve short-term victory. It also requires a movement that demands the rules of the political game change; and now! These are two different strategies, equally important. The one will have a more general left wing agenda; the latter a specific target with little ideology: a campaign for political equality is the most immediate and pressing concern. It should appeal to all citizens, and should cut across party and political lines. The organisation and the movement will rely for its success on changes to the culture, which they will in turn influence when they act and organise. The rules of British democracy will have to change before the left has a chance of instigating a major revolution in policy. We have full political rights, as defined by the constitution, and the conventional wisdom, but our ability to influence the politicians is little different from the workingmen the Chartists sought to organise and represent. Our goal should be to create a system where politics is again a meaningful activity for the majority. In practice this doesn’t mean campaigning on behalf of some grand ideals, although they may exist in the background, but rather to identify the structural obstacles to substantive political democracy, and attack them in a populist and principled way. One that is outside party affiliation, something the AV supporters were unable to achieve – too much the insiders. It is a risk, of course, as the history of Berlusconi shows. It is, nonetheless, a risk that must be taken; though it can be reduced; by creating the coalitions and cooperative associations, a “popular front”, which is prepared for when the old order falls. This movement will target the political class, partly attacking them, and partly building alliances: in Westminster, the press, in the trade unions, the charitable trusts, and in friendly think tanks and university departments. It will also build a coalition with other groups who may share its distaste at this new ruling class, but who have different politics. This is the hard one, and will involve the most work; not least because we will have to control our own prejudices. A new Charter, with a few minimum demands, which if accomplished provides the foundation for future radical reform, by providing an equality of political rights, seems the most promising strategy to create such a populist movement. We should all be Chartists now. Campaigning to take the money out of politics in order to restore our democratic rights. Freedom requires equality. No wonder the reactionaries in our three main parties have embraced the plutocracy; who ratchet up the costs of the political process and so reduce our influence. Equal votes for all! Is this our future rallying cry? (Previous essays in the ‘Creating the Future’ series: ‘Victory begins with defeat’ and ‘When conservatives become socialists’). My Dropout Boogie discusses this at exhaustive length. This is one of main themes in J.K. Galbraith’s The New Industrial State. Alan S. Milward’s The Reconstruction of Western Europe 1945-51 is a powerful analysis of the origins of European integration; and illustrates the hard political and economic calculations that were involved in the various supra-national bodies that ultimately led to the European Coal and Steel Community; its purpose to ensure productive growth in a limited number of sectors of the economy. Interestingly, given the jingoism of the British Right and its worship of America, the US government was generally in favour of a united Europe (they were much more radical than the individual countries). They saw a large integrated market as the only way for its productive capacity to be absorbed internationally. The dynamism of the American economy depended, they believed, on a economically unified Europe. David Marquand’s the Decline of the Public is very good on this topic. Adam Curtis in his own inimitable way deals with this in The Trap. A series that covers the intellectual origins of the ideology that believes public service is a myth. For a look at what this actually means see my Divine Wind. Campaigns against individual companies and products have been successful, and but these are limited victories, and implicitly accept both the structure and the nature of modern capitalism. An excellent summary in Simon Head’s discussion of the universities. See also his One Market Under God and What’s the Matter with America? A forthcoming piece on Libya and the LSE gives a case study.